Energy independence is creeping into the US passenger car market more and more, led by Tesla Motors but also by ZEV mandates in 9 states and resulting EV efforts from a few auto companies. In the month of July, electric car sales surged 48% — mostly on the back of Tesla, but also due to big jumps in sales of the Chevy Volt, BMW i3, Ford Fusion Energi, and Chevy Spark EV. Other EV models also saw sales growth, but their relatively small volumes make them rather insignificant in the grand scheme of things. Based on my estimates of Tesla deliveries (which are based on several statements from Elon Musk and Tesla official reports as well as slight regional variation assumptions from month to month), Model S deliveries remained stable, but Model X deliveries (which were nonexistent in July 2015) surged following a production ramp at the end of quarter 2. As always, nobody outside of Tesla knows the exact percentage of deliveries that go to the USA versus Europe, Asia, and Australia, but I roughly estimate that based on Tesla/Elon Musk statements on the 2015 split and the projected 2016 split. Facing the pending arrival of the Chevy Bolt and Tesla Model 3, the Nissan LEAF lost sales again in July compared to the year prior, but it didn’t fall that much this time — just 9.5% (from 1174 to 1063). The year-through-July rankings show the Tesla Model S and Chevy Volt clearly in the lead, followed by a close race between the Tesla Model X and Ford Fusion Energi for #3, and then with the Nissan LEAF solidly holding onto the #5 spot. 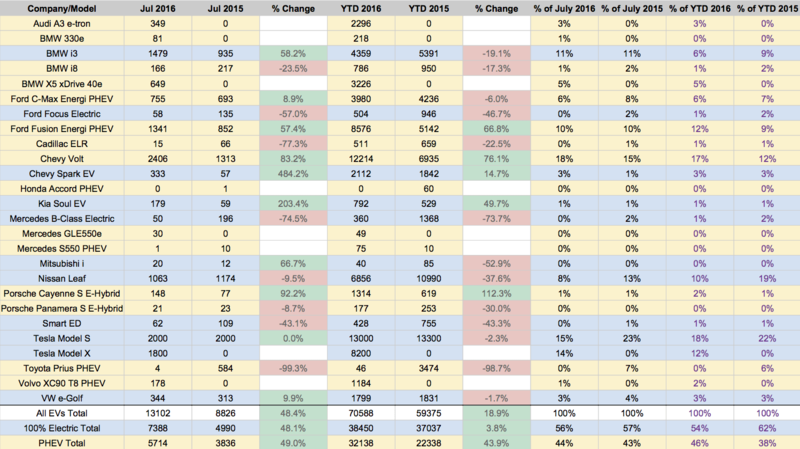 Overall, you can see in one of the tables below that fully electric car sales were up 48% in July 2016 (compared to July 2015), plug-in hybrid sales were up 49%, and overall electric car sales were thus up 48.4%. That’s a big improvement over year-through-July growth, which shows fully electric car sales up 4%, plug-in hybrids up 44%, and all electric car sales up 19%. Overall, electric car sales climbed to nearly 0.9% of overall US car sales (including SUVs, pickups, etc.). Have a look at the tables below or charts at the top for more details. See all of our electric car sales reports on one page.